One of the most anticipated summer restaurant openings is Little Italy Food Hall in, you guessed it, the Little Italy neighborhood of downtown San Diego. This concept, spearheaded by Grain and Grit Collective (the amazing minds behind Carnitas Snack Shack), is bringing together 6 very unique food concepts under one, beautiful roof. Little Italy Food Hall is located on downtown's only pedestrian-only street, the new Piazza Della Famiglia. It boasts indoor and outdoor seating, a full interior bar and outdoor bar cart—count us in! Our GraphicLab team was honored to continue our relationship with Grain & Grit (we also work together on Carnitas apparel), to create not only the staff apparel and merchandise for the food hall, but Not Not Tacos, as well! In case you're curious, Not Not Tacos is the brainchild of Sam the Cooking Guy and the name actually does say it all... Check out their menu and see what we mean! GraphicLab Promotional Products works with a number of San Diego restaurant groups and breweries to outfit staff members and fans. In fact, we consider it a specialty. Our ability to custom print and embroider both large and small quantities means we can accommodate the variety of merchandise orders a restaurant business typically needs like a larger first order, smaller follow up POs and the variety of for-sale logo apparel restaurants need to keep on hand. 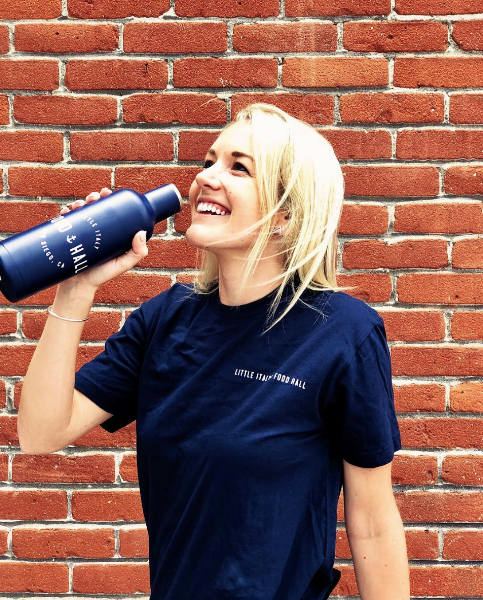 For Little Italy Food Hall and Not Not Taco specifically, we produced staff t-shirts, hats, reusable canvas tote bags, and reusable water bottles. For Carnitas Snack Shack, we've created everything from hats, to t-shirts to embroidered aprons and more. For more information on how we can outfit your restaurant in logo apparel, glasses or signage, call us at 858-437-9100! Little Italy Food Hall is opening to the public Thursday, July 12. We for one can't wait!